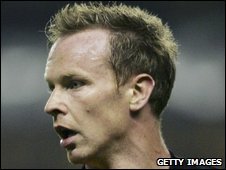 Veteran Wolves defender Jody Craddock has signed a new one-year deal with the Premier League new-boys. The 33-year-old, who has been at Molineux since 2003, only played 17 times last season but 11 of those came in the final two months of the season. He told the club's official website: "I'm delighted to sign the new deal. It's probably one of the biggest achievements of my career. "Hopefully the experience I've got will help around the place." Craddock, who will turn 34 before the season begins, played for Wolves in their only previous Premier League campaign in 2003/04 - making 32 top-flight appearances as they were relegated. The former Sunderland man added: "I feel like I've got more experience than the last times I've been in the Premier League. "The older you get the more experienced you get which certainly helps but it also becomes harder physically and you have to work that much more to stay at that level."